I will never set foot in Edinburgh again. Except, here I am in Scotland, all ready to go to that very part in that very city where James’s detective, Inspector McLean walks, and lives. I suspect the good Inspector and Son of Bookwitch have been neighbours in Newington for the last year. But only for a few hours more! Offered the book as a bribe to the Resident IT Consultant when I returned home from meeting James at Bloody Scotland last week. (Was it only last week?) He read it in one sitting, and no matter how hard I tried to fit in the reading of some other books first, it wouldn’t let me. It really wouldn’t. 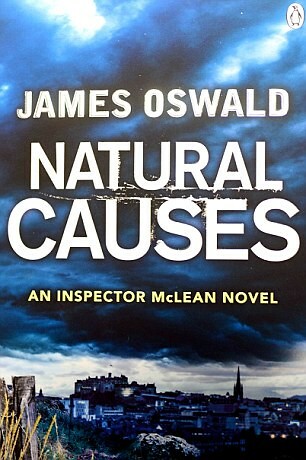 Inspector McLean is an orphan, and his Gran is about to expire after being in a coma for a long time. But then people in her neighbourhood start dying in the most spectacular ways, and she knew them. At the same time McLean ends up with an ancient corpse on his hands, and there are a lot of burglaries which appear to be unusually well planned. As he struggles to find the time to solve these cases, ever stranger things occur. He can’t sleep, and he doesn’t get on as well with some of his superiors as he should, and like many fictional detectives he seems to be surrounded by women. The clues are generally rather obvious, which I found quite satisfying, because it meant I was prepared, but never knew what for. And at the end James leaves some questions unanswered, which is also good. You don’t want things to be too clear. As for the supernatural, well, who knows? I want to meet up with Tony McLean again, and that goes for most of the other characters, too. The ones who survived, I mean. This entry was posted in Authors, Books, Crime, Ebook, Reading, Review and tagged James Oswald. Bookmark the permalink.